Fluid Controls can supply a complete range of W.A. Kates flow controllers. Their superior range of automatic flow rate controllers can be successfully applied to a wide variety of liquid and gaseous applications. Available in sizes from 1/4″ up to 4″ and constructed from a choice of materials with a wide variety of threaded and flanged connections. These controllers can automatically compensate for changes in supply and discharge pressures, whilst maintaining a constant flow setting. The Kates FC Valve has been applied successfully throughout the industry to a wide variety of liquid and gas applications. With a W.A. Kates flow control valve, you can be assured of a high quality and high-performance instrument that will provide many years of maintenance free service. Downstream pressure fluctuations are counterbalanced by the internal regulating valve to maintain the SCFM to within 1-1/2% of the flow setting. Variations in upstream pressure and temperature should be minimised due to the compressibility of gases and the corresponding changes in density. The ratings of Kates FC Valves are catalogued in gal/min for purposes of standardisation. Flow rate through an orifice is proportional to the size of the restriction and the differential pressure across it. 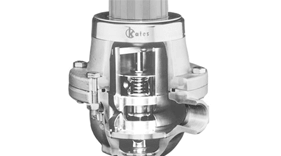 By combining an adjustable orifice with an internal regulating valve, the Kates controller maintains a constant pressure drop across the metering orifice. The automated Kates FC Valve will improve the performance of almost any control loop. A change in input signal will cause a direct and linear change in flow rate regardless of inlet or outlet pressure variations. Turndown ratios for controllers can be ordered as high as 100:1. In addition to stabilising the process loop, it offers inherently accurate cascade control. Custom Valve Concepts, formerly WA Kates, has been manufacturing flow rate controllers for every type of application since 1949. From air to zinc hydrosulfate, Kates Controllers provide a simple alternative for numerous complex flow applications.